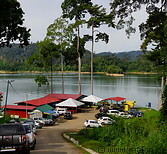 The Temenggor lake is an artificial lake created in 1977 with the damming of the Sungai Perak river. It is 80km long, 124m deep at its deepest, covers an area of 180 km² and extends with its arms deeply into the Belum-Temenggor forest. Boats trips therefore are an excellent way of exploring the park. The Belum Rainforest Resort offers boat trips to the Belum-Temenggor forest, both to the Royal Belum State Park and to the Temengor Forest Reserve. These can be booked individually or as part of a package and include a number of stops (rafflesia, salt licks, Orang Asli village etc. ).